How to Switch Web Hosts? Allow me to take a shot at a scenario you may be in: You’ve built a website for your business and decided a hosting provider that meets your needs in terms of bandwidth, storage, backups, support and more. Over time you become frustrated with your hosting provider at lack of support or technical competence to fulfill your needs. When you started with your web host it may have seemed like the ideal option, now that things have changed it’s time to move to a new web host. If this accurately describes where you are, here’s how you can do it seamlessly. How to change your web host smoothly? It’s really important to take a backup of your website to be double sure to avoid any loss of data before you change your provider. Unexpected scenarios might result in loss of crucial files that could hurt your business while making the switch. Before you change your web host, record and save all important settings like softwares you use and their configurations along with your security settings and email settings. Switching your web host is not that painful. Let your customers know in advance about any downtime you might face. They might assume you have disappeared randomly and would question the legitimacy of your business. A good idea is to load your website files on your new provider’s IP address before you make the switch. The most crucial step of this process is to correctly update the A records of your domain name on the nameservers provided by your new web host. Ideally, you should do this before you migrate completely to face minimum downtime. This process might take up to 2 days considering your older domain provider and web host company is the same. Once you have done the necessary checks and validations and you’re convinced everything is working fine, you can delete your account and cancel your package with your old hosting provider. Restoring your website would include steps laid down by your new web host. 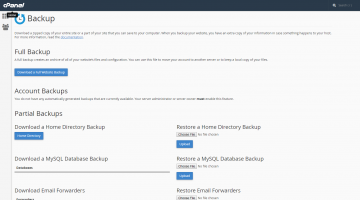 It would require you to go to your cPanel account -> Manage -> Backup Wizard -> Restore -> Home Directory – Upload. Login to your Control Panel, Search for the domain name for which you have purchased this Hosting Order and go to the Order Information view. On the Home page, under the Files section, click Backups and proceed to restore both the Home Directory and MySQL database backups. 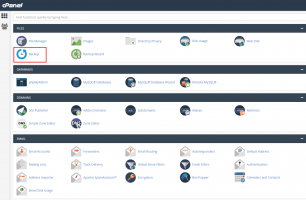 Preview your website from cPanel itself and make sure everything is working fine and your website files are loading correctly. Switching your web host does not require technical knowledge. Although intimidating in the start, it’s actually pretty simple if you follow the steps mentioned above. Watch out for problems that might occur in the process and don’t forget to Backup and Restore your cPanel Databases.